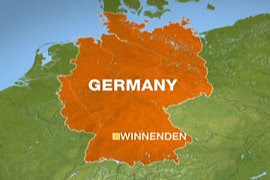 WINNENDEN, Germany: A 17-year-old wielding a Beretta 9 mm pistol burst intoclassrooms at his former high school Wednesday and gunned down students some of whom died with their pencils still in hand in a rampage that ended with 15 dead before he took his own life, authorities said. There was no immediate indication of motive, but the gunman's victims were primarily female: eight of nine students killed were girls, and all three teachers were women. Three men were killed later as the suspect, identified by police as Tim K., fled. "I heard two shots and then screaming," said a 15-year-old student who gave her name only as Betty. "At first I thought it was a joke, but then someone called 'Run, run!' and I saw students jumping out of the windows and took off running." The gunman dressed in all black took students in the first classroom completely by surprise, evidenced by the morbid scene that awaited the first officers to arrive, said regional police director Ralf Michelfelder. The dark-haired teen, shown wearing glasses in pictures on German television, apparently took the weapon from his father's collection of 16 firearms along with a "multitude of ammunition," police said. His father was a member of the local gun club and kept the weapons locked away except for the pistol, which was kept in the bedroom. Police said the suspect was a German teen who was a below-average student at the school of about 1,000 pupils, but managed to graduate last year. Police received an emergency call from the school at 9:33 a.m. 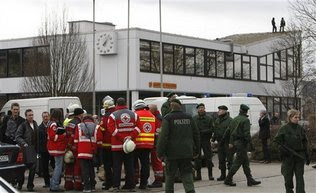 The first officers responded about two minutes later, said Baden Wuerttemburg state interior minister Heribert Rech. They heard shots on the second floor and ran upstairs, catching a glimpse of the suspect on a staircase, Rech said.